Over the last few weeks analysts of the Ostrogorski Centre focused on the treatment of the Chernobyl issue in Belarus' foreign and domestic policies, as 26 April marked the 30th anniversary of the disaster. 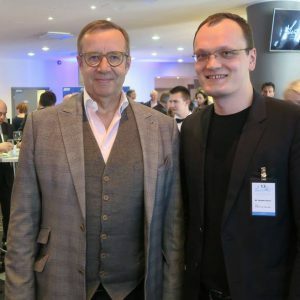 Director of the Ostrogorski Centre Y. Kryvoi with President of Estonia Ilves in Tallinn. Photo credit: Pavol Demes. Over the last few weeks analysts of the Ostrogorski Centre focused on the treatment of the Chernobyl issue in Belarus’ foreign and domestic policies, as 26 April marked the 30th anniversary of the disaster. They discussed the recent Freedom House report on media freedom worldwide arguing that it wrongly ranked Belarus too low and showed how Belarus’ defence industry demonstrated good results even despite Russia’s restrictive measures. On the 30th anniversary of Chernobyl disaster, Igar Gubarevich discusses the return of Chernobyl issue to the list of Belarus’ foreign policy priorities after several years backstage. The treatment of the Chernobyl issue in Belarus’ foreign policy is an example of good-quality diplomacy. When fighting for resources, Belarusian diplomats have learned to adapt their actions and rhetoric to modern trends and the new vocabulary of multilateral relations. Artyom Shraibman criticises the recent Freedom House global report, which ranked Belarus in the bottom ten countries in the world in terms of media freedom. Belarus provides complicated conditions for journalists’ work, but journalism in Belarus remains a far less dangerous job than in many of the countries ranked more favourably in the report. The expert suggests that engaging more Belarusian experts and revising the questionnaire would help Freedom House fight stereotypes rather than spread them. Siarhei Bohdan shows how the Belarusian defence industry has succeeded even while Moscow continues its policy of restricting access to Russian markets for Belarusian defence firms. Minsk is responding by cooperating with Ukraine, China and numerous developing countries. The Kremlin is effectively forcing Belarusians to distance themselves from Moscow and build the economic foundations for an independent state. 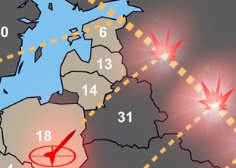 Siarhei Bohdan comments for Polish Radio on the possibility for Russia’s hybrid intervention in Belarus as a response to NATO activity on its western borders. Experts believe that the Crimean scenario is impossible in Belarus. It is more likely that Russia will be pushing Belarus to establishing military objects on its territory. Yaraslau Kryvoi at the annual Lennart Meri conference in Tallinn posed a question to the Foreign Minister of Poland Witold Waszczykowski about the changing perception of Belarus in the new Polish Government. According to the minister, there is definitely a new perception of Belarus in Poland because of the new government which tries to open all channels of dialogue with Belarus to keep it as closely as possible to Europe. Yaraslau Kryvoi comments on the improvements in Freedom House rating for Belarus in 2015. The rating in the field of civil society grew due to the lack of political prisoners, increasing opportunities for civil society to raise funds inside Belarus and peaceful nature of the presidential election. He also explains the situation with the Brexit referendum and how it may affect Belarus to Belsat TV. Ryhor Astapenia discusses on the Polish Radio the feasibility of the construction of the Belarusian nuclear power plant, chances that authorities will support Belarusian language, why China does not invest in the Chinese-Belarusian Industrial Park and how Belarusians should celebrate V-Day. Ryhor Astapenia analyses the chances of Belarusian opposition to boost people’s support at the time of economic difficulties. To become more popular, the opposition should become a consolidated force, demonstrate interest in the daily life of Belarusians rather than focus on geopolitical questions. Ryhor Astapenia explains to thinktanks.by why public administration in Belarus in its current form remains disfunctional. On a number of his examples shows that the government is unable to set realistic targets and ensure their implementation. This leads to a drop in public trust in the authorities. Vadzim Smok explains to Radio Racyja why the Belarusian authorities do not persecute DNR fighters and pro-Russian groups in Belarus. These groups have the support of security forces, the Orthodox Church and the Russian government. In addition, they represent themselves as supporters of Belarusian authorities, although many of them deny the existence of Belarusian nation and statehood. Siarhei Bohdan talks on Radio Liberty on pro-Azerbaijan position of Minsk in the new escalation of Nagorno-Karabakh conflict and Lukashenka’s visit to Turkey. Analyst sees these action as a continuing attempt to keep Belarus neutral and stick to international law, rather than switch to the side of Russia’s enemies. Ryhor Astapenia comments for Polish Radio on the failure of Belarusian delegation at the new loan negotiations with IMF. Belarusian government does not want to take responsibility and tries to represent reform package as the IMF condition rather than urgent internal need. Ryhor Astapenia talks on Belsat TV about the upcoming parliamentary elections in Belarus and new elements of the Belarusian electoral legislation. He predicts that Belarusian authorities will allow a relatively free parliamentary campaign to make elections legitimate for external observers, yet vote counting will hardly become transparent. The BelarusProfile.com database now includes the following personalities: Anžalika Borys, Andrej Bastuniec, Mikalaj Chaliezin, Jaŭhien Nieŭhień, Viktar Šadurski, Maryna Zahorskaja, Alieh Trusaŭ, Anton Matoĺka, Alieh Hajdukievič, Andrej Stryžak. We have also updated the profiles of Uladzimir Siamaška, Uladzimir Siańko, Iryna Tačyckaja, Paviel Tapuzidzis, Aliaksandr Fiaduta, Andrej Jelisiejeŭ, Anatoĺ Filonaŭ, Valiery Fraloŭ, Andrej Charkaviec, Aliaksandr Cierachaŭ, Valieryj Capkala, Viktar Ciareščanka, Mikalaj Čarhiniec, Aliaksandr Čubryk. Tacciana Čulickaja, Natallia Rabava, Iryna Vidanava, Uladzimir Kavalkin, Dzmitry Markušeŭski. Advocacy in belarus: experience of civil society organisations. OEEC, 2016. Tacciana Čulickaja, Natallia Rabava, Ina Ramašeŭskaja, Uladzimir Kavalkin, Dzmitry Markušeŭski. Analysis of the social service sector in the Republic of Belarus. OEEC, 2014. Kirill Shakhnov. Belarusian business cycles in a cross-country comparison: industry and aggregate data. BEROC, 2015. Yuri Tserlukevich, Ilona Babenko, Pengcheng Wan. Is market timing good for shareholders? BEROC, 2015. Aliaksandr Aŭtuška-Sikorski, Jury Čavusaŭ, Uladzimir Arciuhin, Aliaksiej Lašuk, Dzianis Mieljancoŭ, Vadzim Mažejka. Biannual monitoring of the main trends BISS-Trends (January-June 2015). BISS, 2015. Think tanks in Belarus are encouraged to submit their research for inclusion onto the database by completing this form. As NATO started to construct its European missile defence system, Moscow on 16 May held talks with Minsk on its planned response. “We have an identical approach to the missile defence system,” insisted Russian Foreign Minister Sergei Lavrov. His government reportedly wants to deploy its missile units next to the system facilities, also in Belarus. Yet Minsk is resisting placing Russian army units in the country because it would destroy emerging Belarusian neutrality, create a premise for a “Crimean scenario” and deprive Belarus of an opportunity to use its military cooperation with Russia as a bargaining chip in dealing with the Kremlin. Belarus, however, is eager to capitalise on the opportunity to increase its value to Moscow as a provider of security to Moscow, and offer some kind of response to this NATO deployment. Russian foreign minister Sergei Lavrov on 16 May arrived in Minsk to discuss a possible response to NATO launching its missile-defence system. But Russia's response has been known for years. Moscow plans, inter alia, to deploy its Iskander ballistic missiles on the borders of NATO countries. That means in Belarus, too. Officially, Minsk is expressing concern over deployment of additional NATO forces in the region. Belarusian Foreign Minister Vladimir Makei after the meeting with Lavrov also called missile-defence installations “a potential challenge for our Union State.” Yet beneath the surface of this strategic accord there are important differences in the Belarusian and Russian positions. First, the significance of the new missile-defence system for the security of Belarus and Russia differs diametrically. Makei implied this when he referred to the challenge it poses to the Union State, and not the Belarusian state. For Moscow, the missile-defence system poses a fundamental threat. It could partly nullify Russia's nuclear arms and disrupt the system of mutually assured destruction. For Belarus, directly the new anti-missile facilities per se mean little, if anything at all. The Belarusian leadership sees direct threats to national security elsewhere – in the activities of pro- and anti-Moscow paramilitary groups, in the regional destabilisation caused by the war in Eastern Ukraine etc. – not in additional American deployments. Unlike Moscow, Minsk can wait and bargain with the Kremlin. An anonymous high-level official of the Russian Defence Minister on 16 May told Moscow-based daily Kommersant about a clash of approaches on deployment of tactical missile systems to Belarus. The Belarusian government wishes to get new Iskander-M's for free as a member of the Russian-led Collective Security Treaty Organisation, or to buy them. The Kremlin allegedly wants to deploy to Belarus the Iskanders manned by Russian military personnel. These differences fit into the pattern of bilateral relations of recent years. Since the early 2010s, Moscow has sought to minimise its dependence on its Belarusian partner. For more than five years, Russian industries have worked on substituting Belarusian-made military equipment of the Russian army with Russian-made equivalents. Concurrently, it has either denied Belarus newer equipment (e.g., aircraft), or sent it outdated systems or import modifications (S-300 and Tor surface-to-air-missile (SAM) systems, respectively). Instead of providing arms, the Kremlin prefers to send its own soldiers to Belarus, e.g. in 2013-2015 Moscow insisted on deploying the Russian air force to Belarus. In a more recent development Russia deployed its forces alongside the border not only with Ukraine but also Belarus, indicating its attitude towards Minsk, too. In April and early May, Interfax news agency published a series of leaks about the formation by 1 December of three new motorised rifles division – in Voronezh, Rostov and Smolensk provinces of Russia, respectively The last of the three provinces – Smolensk – borders only on Belarus and no other foreign country. Minsk, for its part, in recent years has increased its distance from Moscow in the foreign policy and national security spheres – e.g. through its positions on Ukraine, resisting Russian plans for an airbase in Belarus and repairing relations with the West. No doubt the Belarusian government currently would prefer not to endanger this emerging Belarusian quasi-neutrality by having the Russian army deployed in the country. Deployment of quite a number of Russian battle units also makes the Belarusian leadership think of Crimea, where such Russian forces in 2014 overwhelmed the Ukrainian army. Belarus already hosts two Russian military technical facilities, but they date back effectively to the times before President Alexander Lukashenka and in any case no real Russian battle troops are garrisoned there, mostly just technicians. One has to remember how much Lukashenka has resisted the Russian airbase in the past three years – although an airbase would be unlikely to bring about a 'Belarusian Crimea' scenario, it would still bring more Russian soldiers into the country. No doubt Lukashenka would die resisting Moscow's plans to deploy numerous ground forces with Iskanders to Belarus. Last but not least, deployment of Russian Iskanders would mean that Minsk lost some of its significance to Russia as a provider of security for Russia's core region around Moscow. That is probably the most precious service the Belarusian government can offer the Kremlin at the moment. This service relies on two components: Belarus' geography and the armed forces. While the former remains constant, the latter – especially its air defence component – has to be maintained in order to function as a bargaining chip for the Belarusian government in its dealing with Moscow. That is no easy task for a Belarusian government that is short of funds. Yet it realises that degradation of the national army could have fatal consequences for Belarusian statehood. Thus, after being pressured by Moscow to fulfil its obligations with regard to Minsk's participation in the united system of air defence or to accept a Russian airbase, Minsk immediately found the money to overhaul and deploy in 2014-2015 the lacking fighter jets. The Belarusian government arguably will act in the same way when dealing with Russian insistence on deployment of tactical ballistic missiles to the country. Minsk realises that Moscow probably would not give Belarusians Iskanders and would look for other ways to cope with the situation. Anticipating the situation, last winter it ordered the Belarusian army to train with older tactical missiles systems. Second, the government can use arms it has received from other sources. Although the Belarus-Chinese Palanez multiple launch rocket system is definitely not equivalent to the Iskander ballistic missile systems, it could be sufficient for more limited missions of the Belarusian army, also with regards to providing security for Russia. The Belarusian government can capitalise on the new regional security developments which will follow the US missile-defence system by strengthening its position vis-a-vis Moscow. The Kremlin can do little to pressure Lukashenka without risking toppling him and either destabilising the country or driving it into the Western bloc. Thereby, Minsk is becoming involved in a global confrontation with all the gains and risks that involves.